Knowing your personal yardages for every club will give you an extra advantage when facing difficult shots during play. By using a COOLSHOT 40i golf laser rangefinder to learn your distances while you train, you’ll gain the precise knowledge you need to improve your score on the course. Get the slope adjusted distance for any uphill or downhill shot, thanks to the all new Golf Mode – found only in Nikon’s COOLSHOT 40i golf laser rangefinder. By utilizing Nikon’s highly advanced ID Technology, you can be confident that you have an accurate angle-compensated distance, so that you can select the right club and hit the ball at the proper trajectory. With HYPER READ Technology, you will receive extremely quick measurement display, regardless of the distance. This will allow you to get quick readings to various points on your approach. On those warm summer days on the course, even the lightest golf bags can seem like a load. 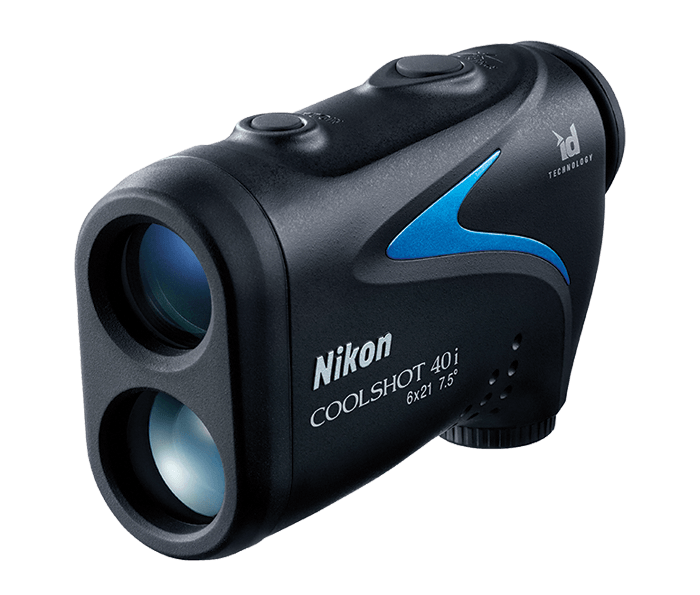 That’s why the COOLSHOT 40i golf laser rangefinder was designed to be extremely lightweight and compact. Whether stowed conveniently in your pocket or attached to your bag, you’ll hardly even notice the six and a half extra ounces of this portable laser rangefinder.